The Chopin Project consortium meeting for the 6th month of activity was held in Bremen (Germany) on 25 September. 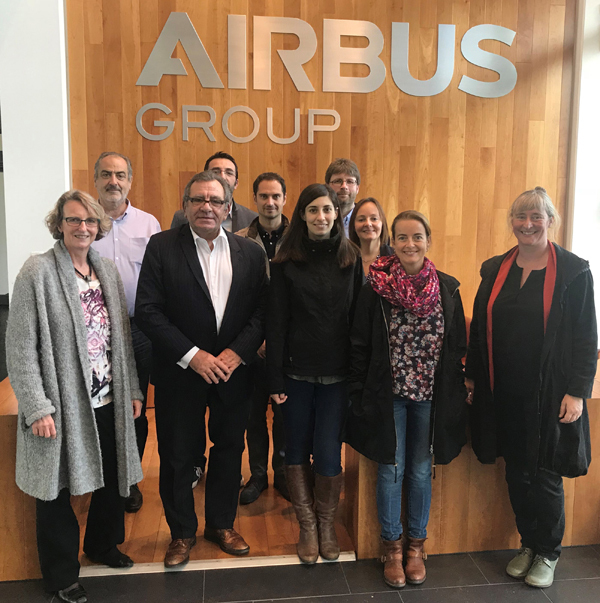 The advances made for the 6-month term were presented at the encounter and, to conclude, the attendees visited the Airbus installations in the area. The Chopin project (Coatings with hydrophobic and/or omniphobic properties against insect contamination) purports to develop long-lasting hydrophobic coatings that can be applied to micro-perforated surfaces habitually used in the leading edges of planes to reduce drag coefficient, and to validate coating technologies and processes using tests that accurately assess the reduction of insect contamination in actual conditions. All of this responds to the aeronautic Industry preoccupation for the increase in drag coefficient due to the adherence of insects to surfaces and their negative effect on laminar flow, with its consequent direct impact on the fuel consumption of aircraft. The consortium is spearheaded by Materia Nova and includes Norut, VKI and Berthier as members, apart from CIDETEC.